The second single by Mary Wells, already a star in the making following her unexpected Top 10 R&B debut Bye Bye Baby, couldn’t have come at a better time for Motown. The company had had no hits at all in four months, since the Miracles’ forgettable Ain’t It Baby had scraped the pop Top 50; Barrett Strong, once a bankable performer, had missed the charts entirely with his last few releases, the Miracles had struggled to follow up their national smash Shop Around, and none of the new artists the company had invested in (the Contours, the Supremes, Marvin Gaye, Jimmy Ruffin, Debbie Dean, Henry Lumpkin) had made much of a splash. As well as poor sales, Motown had released a slew of singles in the early part of 1961 which were of decidedly poor quality, garnering no critical attention and no word-of-mouth. But although Motown seemed to be treading water, Berry Gordy wasn’t about to repeat past mistakes. Despite knowing he had something special on his hands with Mary Wells, he refused to rush-release Wells’ second single, conscious that he risked ruining the momentum that was starting to build around his young starlet by putting out a sub-par sophomore release. Instead he took his time, writing and working out arrangements, allowing Mary to continue to build her excellent reputation on the live circuit and grow her ever-increasing fanbase while he crafted a surefire hit single for her. In this task, Gordy was aided by the newest member of his growing songwriting and production corps, William Stevenson, universally known as “Mickey”, soon to become the head of A&R during Motown’s early/mid-Sixties golden age. Perhaps Stevenson’s arrival was just what Gordy needed to help mix his stale palette; this engaging, danceable R&B pop number sounds fresher and more vibrant than any song Gordy had had a hand in writing since the Miracles’ Shop Around, and marks an important step in the development of Motown from Berry Gordy’s personal project into a magnet for songwriting and performing talent from all over America: a genuine artistic force. This was the first Motown single to come out with a picture sleeve (right) rather than a plain bag, and the first to feature the subsequently world-famous blue Detroit-centred “map” label, which would go on to conquer the world, rather than the previous cheap pink “diagonal lines” label previously in use (and which was used for the promos and a few early print runs here). 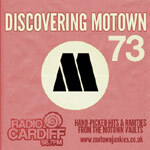 It’s tempting to think that maybe Gordy had let things slide with the rest of the Motown release catalogue, taking less of a hands-on interest in a run of disappointing singles knowing that he was building to take things to the next level with this one. Or maybe none of that would matter if it wasn’t for Mary Wells, by some distance the biggest star the label had on its books so far. Sassy, charismatic, beautiful, and a superb singer, Wells is electric here, her smoky, mature voice sounding much older than her actual age of 18. It’s a song about guardedness and nervousness, not wanting to lay your heart on the line for fear it’ll be stepped on, as Mary exhorts her boy to put up or shut up; she won’t give him her love only to find herself dumped two weeks down the line. (There’s a possible unspoken subtext there, obviously, of not wanting to sleep with him, even give up her virginity – but while Wells actually was a young girl, just turned eighteen, she sounds much older here, much more mature and worldly, and so ironically that ends up taking some of the sexual tension out of the song). It’s a great performance, and definitely a far stronger song than Bye Bye Baby, and although it’s not immediately identifiable as a Motown record, it’s a definite step towards the Motown Sound and wouldn’t have sounded too out of place in 1963, right on the cusp of the company’s final push to the summit of pop perfection. Wrapped up in one of the best Motown backing tracks to date – absolutely no expense had been spared in making sure this sounded good, perhaps to the disadvantage of the groups and artists who’d had records released in the past few months – it’s an excellent song. Fast-paced, enjoyable, featuring a great, memorable chorus, it was a deserved and long-awaited hit, again going Top 10 R&B, Top 40 pop and cementing Wells’ reputation as an emerging star in a way neither Barrett Strong nor the Miracles had managed on the back of their own big hits. It’s probably the best hit single Motown had released since Strong’s Money (That’s What I Want), and certainly more fun and listenable than Shop Around. If it’s not a pop classic, it’s not far off, and it certainly gets my seal of approval. Gets me dancing, at any rate. It would be nice to say that now Motown had the hits, had the star, had the corporate image, had (most of) the musicians, had the songwriters and producers, that it was plain sailing from here to that mid-Sixties golden age, but really this was just the start; there were still two more years of toil and a lot more misses than hits to be endured before they’d get to where they were heading. But this is a definite start along that path nonetheless, and a great song to boot. Mary Wells was still a ways away from finding her “voice” so to speak when she did this follow-up to Bye Bye Baby. She’s not so hoarse here and the organ backing track compliments her wonderfully. You knew something special was brewing here. They mis-spelled the new guys name. The first pressing runs of the commercial store stock of this release were also on the pink striped earlier label design. “Stevens” was NOT a misprint. Originally, they were thinking of using that abbreviated form. The horns really give this song it’s flair and the piano is really rockin! And last but not least, Mary’s delivery is soooo much like her personality from what I’ve heard. It’s wild, fiery and filled with attitude (lol) all of which sells this song. Instead of simply narrating a story, Mary brings the listener in. I feel as though I’m watching from a close distance with a group of friends, Mary telling her lover off, and I’m agreeing with her while laughing and enjoying every minute of it. Great song! Btw Mr. Nixon brought up an interesting thought about the LGBT community. I wonder if this song was infact a huge underground gay record because of the “I don’t wanna come out.” Similar to the large underground hit of Freda Payne’s “Band of Gold” or Diana’s “I’m Coming Out.” The latter definitely not being a secret LGBT anthem (lol). Its cool how the strings sometimes act as background singers. Its also funny how something that you loved so much back then can sound so hopelessly dated today. This ain’t Motown music, this is Detroit R & B!! A great song deserving at least the “8”. Best of all, I had never heard this one so I’m getting that “new song rush” as it hooks its way into my heart. And that’s why I love this site so much! There’s nothing like the rush of the first 10 listenings to a classic. I wonder if anyone discovering this site has never heard all those HDH-in-their-prime tracks. To suddenly have all those growing on you at once could be dangerous to one’s health. I remember when I first got the Jamerson book and for some reason I knew almost every song EXCEPT Bernadette, which of course all the bass players were drooling over. So I actually have a recent memory of the “growing on me” experience with that one and it was quite a rush. Trying to ignore the fact that I’ve heard Shop Around over 1000 times and started listening to I Don’t Want to Take a Chance tonight, I’d say that while the latter’s use of minor chords isn’t all that remarkable post-Beatles, it was, in 1961, pre-Beatles, arguably much more original and forward-looking than Shop Around. But in that intangible category of “timeless hooks”, I still think Shop Around is the top single thus far. Now I need to listen to I Don’t Want to Take a Chance about 1000 more times and see if I was right (the line “I don’t want to take a chance and come out … and come out … on the losing end” is still on repeat-play in my inner ear).